Painting printed direct to glass and laminated by Studio Art Direct. Artwork by Marla Baggetta. Art on Glass – direct to glass | Artwork such as photography, paintings and digital arts can be reproduced on glass by printing with archival pigment inks with a high viscosity. Printing direct to the surface shows brush strokes and is very luminous. For this installation, a super high-resolution scan of an original acrylic painting I commissioned specifically for the project was done. This scan was expensive, but worth it as it is the single most important step in any large-scale installation because if an image is pixilated, it looks cheap and amateurish. This image was res’d up to 9’0″ high, printed direct to the seconds surface of glass. Another glass layer was then painted with a soft, translucent white and then both were laminated together so that the glass was tempered for safety. The effect is that the image provides some privacy, and yet light floods through it from the inside. Vinyl graphics on second surface of tempered glass by Studio Art Direct. Photography by Zeb Andrews, poetry by A. Moloktov (pictured). Art on Glass – vinyl | Any high-resolution scan of artwork can be reproduced on vinyl using archival inks and then mounted to the second surface of glass. However, photography and graphics are best suited for this type of installation because the nature of a print to vinyl is better suited for large swaths of rich color that are not meant to show the subtleties of brush strokes or depth. When using photography, such as the image shown here, you need to start with a very high-resolution image preferably shot in large format so that when the image is enlarged (9’0″ x 9’0″ in this case) it holds the resolution (at least 150 dpi at full size) and is not pixilated. Pixilation is a vexing problem when an image is meant to be seen up close. 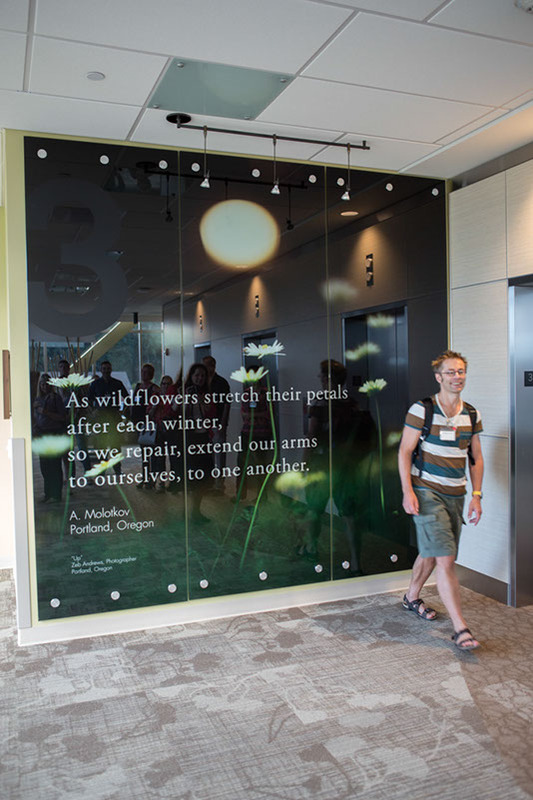 In this installation, custom 2″ aluminum standoffs were fabricated to add an architectural element and to hold secure the three 3’0″ x 9’0″ glass panels. The wall required 3/4″ backing to withstand the weight. Digital art printed on laminate and installed as a vertical casework element by Studio Art Direct. Artwork by Joe Futschik. Art on Laminate | Just like your mother’s counter tops, laminates are extremely durable. But with today’s technology, it can be used on vertical surfaces such as walls, casework, cabinet fronts, doors and dividers. And any artwork can be made into laminate. The advantage of a laminate is that the material is extraordinarily durable. It doesn’t scratch and is cleanable. This is of special concern for healthcare projects where gurneys can slam into them and solvents are used to clean bacteria off surfaces for infection control. Laminates are created by first creating super high-resolution scan of artwork. You need to know the fabrication process to understand what the best DPI output is at full-scale and the preferred color profile so work closely with the fabricator to prep the files correctly. The image is then printed on a heat sublimation paper, and this paper is heat infused unto the second surface of a clear laminate. Art on Vinyl + PVC protection | One of the most cost-effective ways to create large and dramatic art in architecture installations is with wallpaper-like murals. The best material for high traffic locations is vinyl (the same material used to put logos on vehicles and signage on windows.) Most sign companies can create this type of graphic. But not all sign companies are sensitive to the color adjustments and subtleties of art that is required prior to printing. So be careful who you choose. Ask to see samples of their work. Be sure that the costs include running a swath of the image for your approval prior to final printing. In this image, huge 9’0″x14’0″ photographs of outdoor activities were installed in a stairwell to encourage people to use the stairs. Stairwells, like many other large wall surfaces in buildings, require that the material be fire rated according to code requirements. Make sure that the specs for the vinyl meet code. Also, the walls must be prepped to receive the vinyl. In most cases, the wall should be smooth and painted with a semi gloss paint. This ensures the best adhesion. In most applications of vinyl, where the image can be touched by the public, I recommend a PVC over laminate to protect it. Regardless, if a vinyl installation is in a high traffic area, it will show wear and tear quickly. Expect to replace it every couple of years. Original commissioned painting reproduced on plexiglas by Studio Art Direct. Artwork by Marla Baggetta. Art on Plex | Plexiglas is a more affordable alternative to glass yet gives that translucent feel. It comes in varying thicknesses so there are nice options depending on the application. The downside is that it will scratch over time. So this is an excellent application for areas that are somewhat protected. In the picture shown here, the wall is slightly curved so I used a thinner, more pliable plexiglas that had just enough bend to handle the curve. The most crucial issue in this installation was collaborating early on with the interior designer and architect to design an installation system that worked seamlessly into the casework and was durable. Just like a frame can enhance a piece of art, the finish carpentry on an installation makes all the difference. In this case, an aluminum U channel system was used as well as stand-offs. To give it a three-dimensional look and hide the seams, 3-Form overlays float over the plex background. For the artwork, I commissioned an artist to paint an abstracted landscape incorporating the interior color palette. The painting was done in pastels and acrylic on paper at less than quarter of the actual full size. I then photographed the painting in quadrants and then stitched them together so that the final output had extremely high resolution at 300 dpi at the full size of 6’0″ x 36.0″. 1. There must be collaboration in the early phases of design with the architect, interior designer, owner and contractor. This is not a “plunk art” approach – you must design for it prior to completion of the building, preferably in the design development phase, because it may require structural, electrical, or unique fabrication and installation considerations that can be very costly or prohibitive if done too late. 2. The design ideas above require digital use of original photography or paintings, so you must license the use of the image or pay a royalty to the artist. This is typically negotiated based on size, placement and other factors. 3. It is very important artwork is pre-pressed by a professional who understands your chosen fabrication process. You need to know the preferred DPI (at full size), color profile, and file type that the fabricator needs for the best compatibility and results. There is no room for error when creating large expensive installations – color, resolution and other concerns will be glaringly obvious upon completion. 4. Whenever possible, put the fabrication of the art in architecture installations in the GC budget, not the art budget. The artwork, scanning, pre press, and project management can go in the art budget, but the materials and installation can be easily integrated into the construction documents as they can be considered part of the building. 5. Lighting is the icing on the cake for art in architecture installations. Plan for it.